No matter what kind of dental issue you have, there’s usually more than one way to repair damaged teeth. The best treatment will restore both the look and function of the teeth. Besides saving teeth from extraction, expert dentistry makes it easier to care for them in the future. Two restorations patients are often curious about are veneers and crowns. Dental veneers are thin shells made from porcelain or composite resin. They fit completely over the front surface of teeth. Because they cover the most visible surfaces of the teeth, they are mainly used to improve appearance. Many people seek dental veneers to beautify teeth that have been permanently discolored. Veneers mimic the look of tooth enamel and will blend in with other teeth over time. Plus, they make the treated surface less prone to decay. Veneers can resolve other cosmetic imperfections, such as a chipped tooth or one that has worn down with age. They are also used to reduce the appearance of gaps and certain otherwise minor alignment issues. This is a good choice when braces and other orthodontic help are not desired. 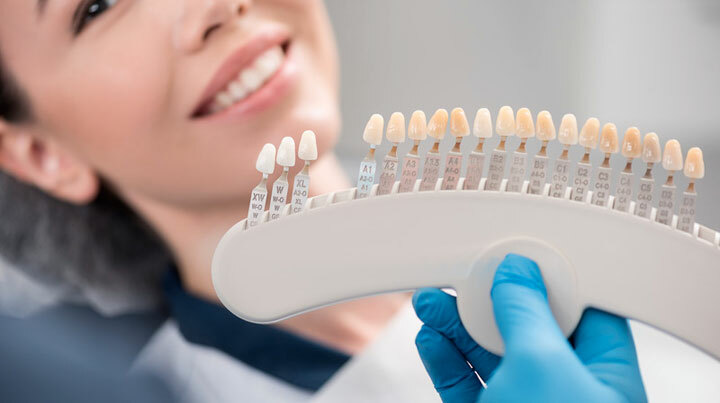 Whereas dental veneers cover only the front surfaces of the teeth, a dental crown is a “cap” that fits over the entire visible surface of the tooth. It is most frequently used in situations where the structural damage to the tooth is severe. Dental crowns can protect teeth that have experienced major dental decay. They are also used in cases of moderate trauma to teeth, such as an auto or sports accident. A crown is often the last alternative to removing the tooth. Dental decay can still occur under and around crowns. However, with good dental hygiene, this can be prevented. Once the crown is placed, the interior tooth surfaces are less likely to succumb to decay, but patients must be careful to care for the exposed gum line beneath the tooth. With appropriate care, both veneers and crowns are likely to last for decades. Although they are both valuable aids to dental health that look and act like natural enamel, they are used in different situations. An experienced local dentist can help you choose the right option for you. At Coscarella Family Dentistry, we’ve given patients just like you a confident smile with the best crowns and veneers.